If you’ve been to Spain then you would know what Sangria is. 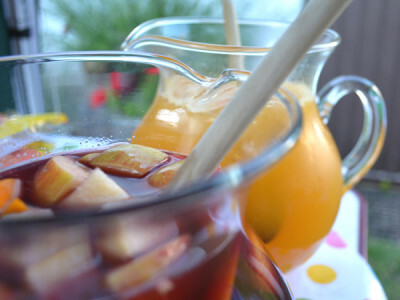 For those who have never heard of Sangria, well, it’s commonly a red wine based drink, served by the glass or jug with ice, with slices of apple and orange, although some these days seem to have a fruit cocktail in them. The wine is usually around 50-60% of the drink. the rest is made up of orange juice and lemonade or soda water. Now if you are lucky and have a good bartender then you will get the full monty edition, which has a slug of brandy, a slug of triple sec or cointreau or some other orange based liquor such as 43 and there may be a slug of vodka or tequila in there too. I remember being on holiday on the island of Lanzarote and sitting in a bar that had big umbrellas and seats with fat cushions, but it was empty. Maybe it was the jug of Sangria at 10 euros a pop. It was a pirate themed bar and looked pretty trendy. However, across the way was a small hole in the wall bar that was packed and they offered Sangria at 5.95 a pop! We finished our watery red wine with fruit and moved bars and well, all I can say was that after the first jug of Sangria at the hole in the wall bar my life changed! The trouble these days too is that you can buy ready made Sangria and I must say that at 7% alcohol, it does make a refreshing afternoon tipple in the summer without you getting wasted. My version has to be served after 6.00pm, but it’s well worth the wait for you booze heads! I do also sometimes serve the ready made Sangria but spike it a bit. So nowadays I make a couple of 1.5 litre jugs to start. I make the traditional red wine version but I also make a white version using Cava, the Spanish sparkling wine. Here are my two recipes, and please, do yourself a favour, don’t start adding strawberries,berries and cherries etc. Best to use a 1.5 litre jug. Put the ice cubes in the bottom. Pour in the shots, the wine, the orange juice. Top up with lemonade and give a good stir. Best to use a 1.5 litre jug. Put the ice cubes in the bottom. Pour in the peach liqueur, the Cava, the peach juice. Top up with lemonade and give a good stir.